Decorating your fireplace mantel can be tricky, and if you're like me and want a new look for each season/holiday it can get expensive. 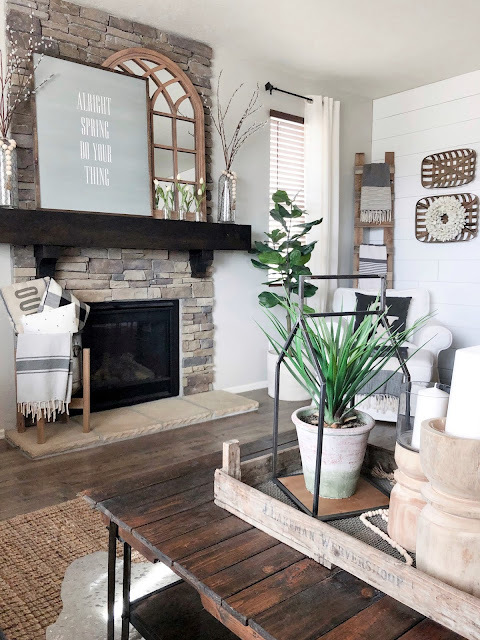 I have come up with three ways you can style your mantel using the same core anchor pieces, making it easier to switch out the smaller decor from season to season! First let's establish our anchor pieces that will be used throughout all the different looks. My biggest focal point is the larger mirror. I chose this one because it is a perfect piece to use in layering without being distracting. The wood frame and simple design draws your eye in but doesn't distract from the sign that's in front of it. The other anchor pieces I have are the vases with tall flowers on each side. This works great to get everything symmetrical, making it ok to keep the mirror and large sign off-center because the vases bring balance to the whole display. 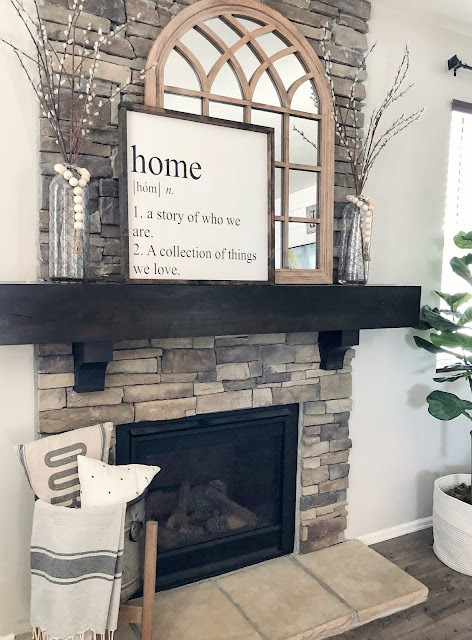 Finally, for this everyday look, I added the "home" sign and wood beads as decor. They look great and are easy to switch out! For my spring look I swapped out my "home" sign for this larger spring sign, and added some wood beads on the vases. I also found these cute glass bottles at the Target dollar spot and put some real touch tulips in each one to give it a spring touch. By keeping the anchor pieces I didn't have to change a lot but got a whole new look for spring!! For my summer look I did something a little different than before. I love lots of greenery in the summer so I wanted to show that. I changed the cotton stems I had in the glass vases to some faux seeded eucalyptus, added some faux succulents inside 2 different color mason jars, added a faux boxwood wreath over my mirror, and added some fun vintage candle sticks and candles. Just like before, I kept my anchor pieces the same and incorporated smaller/different decor for a new season and fresh look!! Thank you!! I love to change it up but keep the main pieces that I love all year round! All three are fantastic! I love how each one has a large piece which makes a grand and beautiful statement! I especially love your mix of woods throughout the mantel and your gorgeous room. Happy Spring! Thank you so much!! I love statement pieces and the large signs are perfect for this! 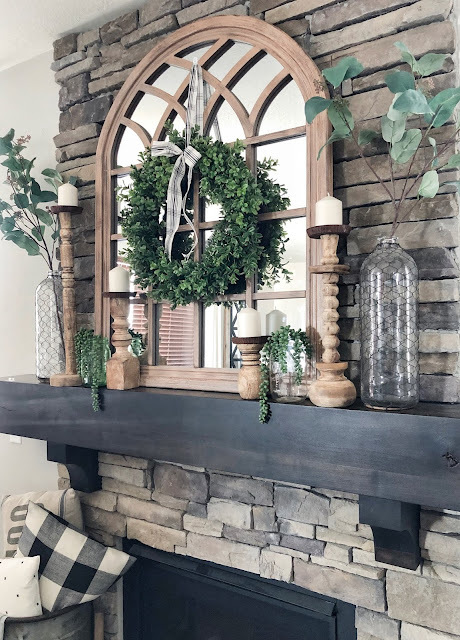 I love seeing your mantel throughout the seasons! You style it so well and every shot looks like it could have came right out of a decor magazine. So happy to be hopping with you this week! Thank you that's so kind of you!! Your sweet words just made my day, glad to be hopping with you this week as well. Hope you have a great weekend! All three are just gorgeous! I love the mirror and the candlestick holders in the Summer version especially. I adore your style and am so happy to be hopping with you this week! Happy Spring! Thank you!! Its fun to play around with! Thank you my friend, that's so sweet of you to say!! Gotta love the target dollar section! !